Head to Wallajah Road near the Chepauk Stadium to pick up affordable, quality sporting equipment and print custom team jerseys. Being on the same road as the MA Chidambaram Cricket Stadium (aka Chepauk Stadium), Wallajah Road sees a lot of sports fans especially cricket fans, throughout the year. So to cater to them, over the years plenty of independent sports stores have opened on that street. Now, these aren’t like any regular sports stores, they’re very similar to stores like Sportus; they stock goods for almost all sports, with a large emphasis being on cricketing goods. Swimming goggles, footballs, boxing gloves, carom boards, inner compression wear, and badminton rackets are just a few of the many goods you can hope to find. 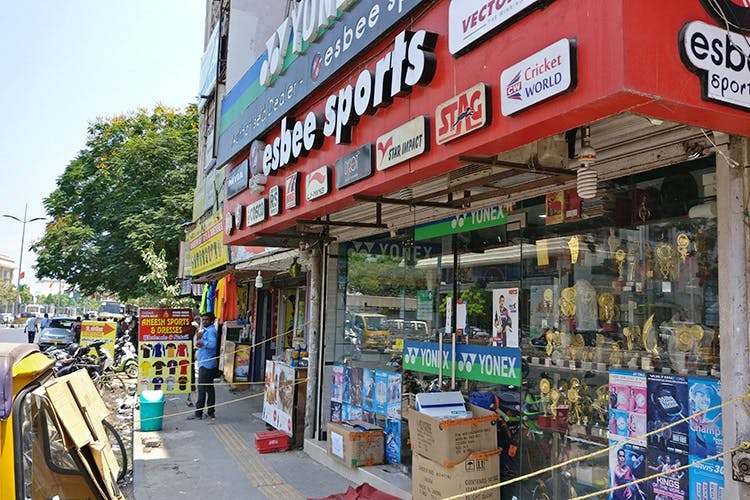 The sports stores are of different sizes with the larger ones in flashy showrooms offering higher priced goods and extra services (seasoning cricket bats, restringing badminton rackets), whereas the smaller ones offer the best prices and allow haggling (cricket bats starting at INR 1,000). So there’s quite a bit of range to play with if you’re looking for sports equipment; Badminton rackets, for example, start at INR 150 and go up to INR 20,000 for the more professional brands like Yonex. Speaking of brands, you must know that you won’t find Nike’s and Adidas’s but more common and affordable brands like Nivia and Champion that have been around for a long time. So if high-end brands are what you’re looking for, you’re better off shopping online or at branded outlets. There are also stores that focus on gym equipment (dumbbells, etc), boards and tables for table tennis and pool, medals and trophies for award ceremonies. Cricket players will have in all probability heard of Wallajah Road because of all the cricket equipment available; there’s everything from abdominal guards to entire cricket kits. Definitely worth checking out if cricket is what you’re playing. All in all a short walk up and down the road will give you a sense of what to find where.